WARNING: This is a preview of Wreck and Ruin. All components and rules are prototype and subject to change. Have you ever seen the classic 1979 movie Mad Max, or the 1981 follow up Mad Max II, or my personal favorite Mad Max Beyond Thunderdome from 1985 (man Tina Turner rocked in that one), or maybe the newest installment Mad Max Fury Road? Well if you have then Wreck and Ruin is going to have a familiar feel to it. Mark McKinnon started posting pictures of Wreck and Ruin on Facebook a few months ago, and it got my immediate attention. Since then he has continued to torture me with his simi-daily posts until finally the day came when he reached out to us to do a review at which point we (meaning I) jumped on the chance. In Wreck and Ruin players will be taking control of a post apocalyptic faction of mayhem causing motorist vying for control of valuable salvage in a dark and desolate world. The player who can do this best over six rounds will be the Kaiser of Kaos (intentionally spelled wrong) and winner of the game! Although Wreck and Ruin is skirmish game with miniatures, set up is quite easy. 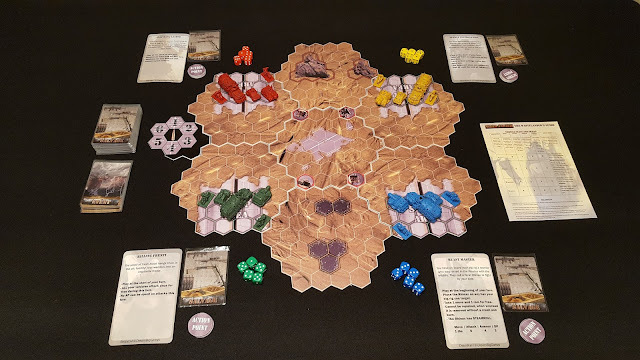 The board is constructed in the center of play by combining seven double sided boards in a flower sort of shape with the player starting areas equal to the number of players face up. See below. Four Salvage tokens are added to the center board and the round tracker is placed along the side of the board with it's bullet token pointed at "1". The Salvage deck is shuffled and each player is dealt one card, the remaining cards are placed face down to create the Salvage draw pile. The event cards are shuffled and placed face down next to the Salvage draw deck to create the Event draw deck. 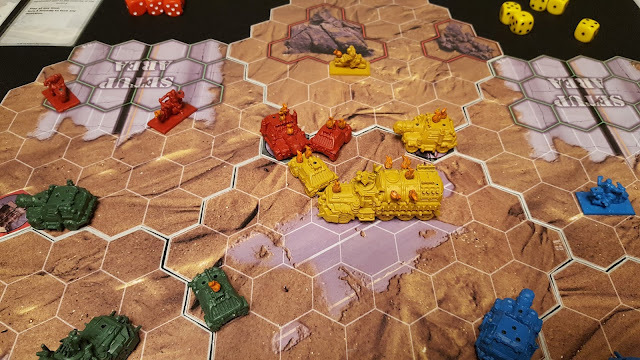 Each player then chooses a faction and takes one of their faction power cards (out of four), their faction vehicles, the corresponding dice, five action tokens, and a player aid. The damage tokens (so cool) along with remaining Salvage tokens and other tokens are placed off to the side for later use. 1) Moving. A player may move a vehicle up to that vehicle's maximum movement distance. 2) Attack. A player may attack an opponent's vehicle that is within range (three spaces). This is done by rolling the number of attack dice for the vehicle that is attacking and comparing the results to the defending vehicle's armor. Hits are indicated by the super cool damage tokens (IE Flame Pegs) placed onto the damaged vehicle. 3) Ram! Yep you read that right, a player may choose to ram their opponent's vehicle causing damage and possibly moving the vehicle (maybe even off the board). 4) Scout for salvage. Players may use an action to draw a salvage card. 5) Repair. Players may use an action to attempt to repair a damaged vehicle by rolling equal to or above that vehicle's armor value. 6) Get a vehicle back in play. If a vehicle is knocked out of play (through damage or being knocked off the board), that player may bring the vehicle back in play using an action point. Although players may do any of the above actions each vehicle may only do up to two actions per turn (some exceptions may apply). Players will be moving, attacking, and ramming all in effort to recover the salvage tokens out on the board. If a player moves onto a salvage token it is flipped over from the red side to the green side. It will stay that way unless another player successfully attacks the "occupying" vehicle. If the token is occupied through the end of that player's turn she is awarded that token. 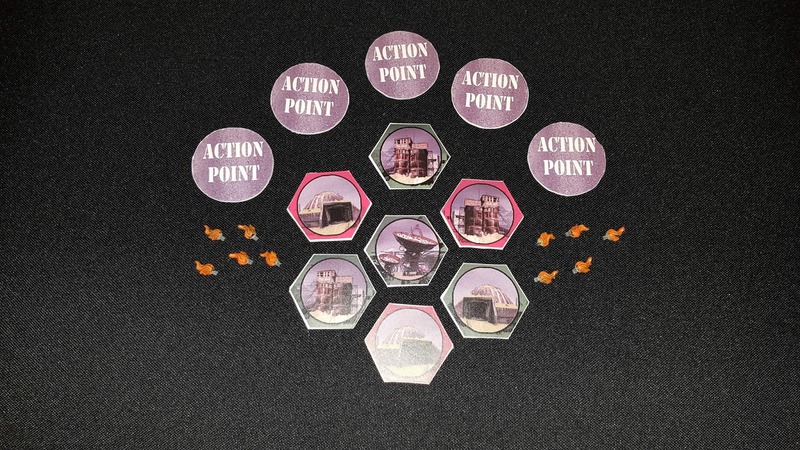 A new token is then placed out onto the board so there are always four tokens available at a time. Once a player has taken her five actions play proceeds to the next player. Once all players have taken their turn a new round will begin. At the start of each new round (except round one) players will draw a new event card that will change up some of the game rules. This continues until the ends of the sixth round (or less depending on the number of players) at which point players tally up the salvage tokens they have accumulated over the course of the game and the player with the most wins!!! Wreck and Ruin has everything you could want in a Skirmish style game: a great theme, easy to understand rules, quick game play, and cool minis!!! 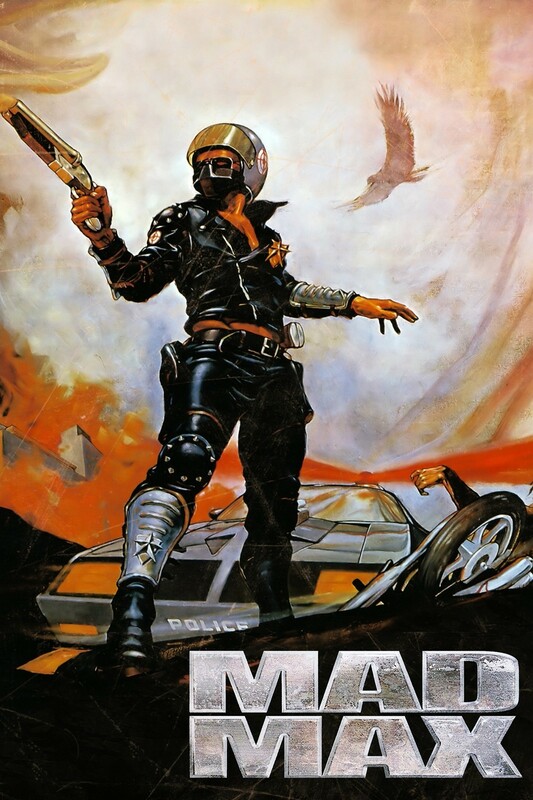 As I mentioned above the theme is a post apocalyptic vehicle battle which works so well for this style of game. Fighting for salvage and trying to survive is the name of the game. All the mechanics employed really bring this emotion to the surface of the game. One of these cool mechanics that Mark added is that when a vehicle gets it's last flame peg it continues to move (from it's momentum) and can crash into other vehicles causing more havoc. 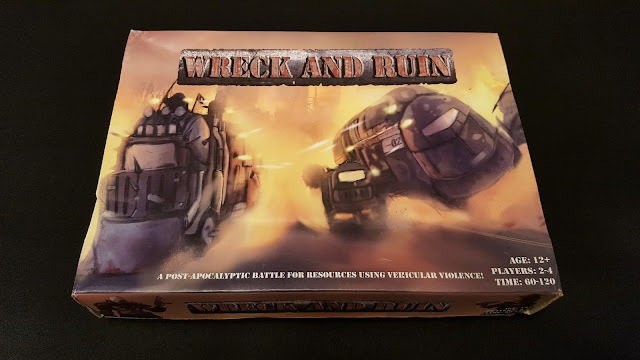 What adds to the awesomeness of Wreck and Ruin is the ease of play: the rules are short and sweet, easy to understand, and to reference through out the game. I was really surprised by this as I have played games like Warhammer in the past and have spent hours trying to figure out the rules and all the minute details. Not the case here as game play is very straight forward. Wreck and Ruin also plays quickly. I think the box says 90 minutes, however we got through our games much quicker. more like 45 minutes to an hour. 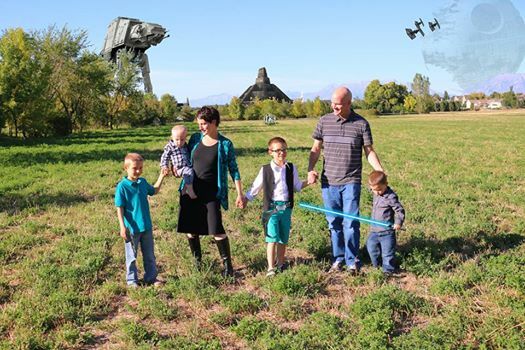 I even had my kids playing this and they loved it!!! Once I explained the rules they were able comprehend how to play although the strategy was still a little above their heads. Now to the best part, artwork and components. 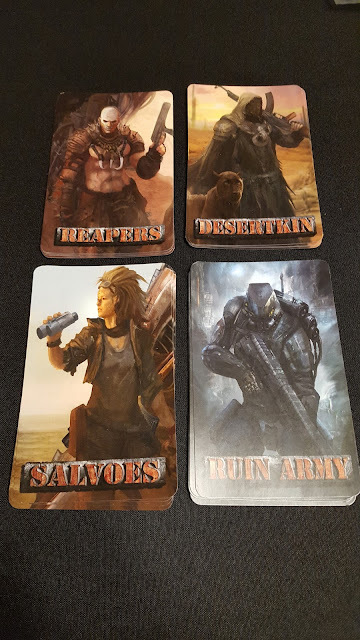 The artwork for Wreck and Ruin is solid and the miniatures are amazing! Even though this was a prototype I was amazed by the quality and detail of the vehicles. I can just imagine with a little funding how great the final product will be. Everything in the game screams post apocalyptic which really draws you in as a player and makes the experience even more enjoyable. Salvage tokens, Action tokens, and FLAME PEGS!!! Besides the amazing minis I really like how quickly Wreck and Ruin plays. Some skirmish games can take for ever but W&R plays pretty quick. It is also relatively simple compared to other titles in this genre. The first thing that comes to mind here is that I had to give it back. Other than that W&R is a very solid game that has little to no down time. 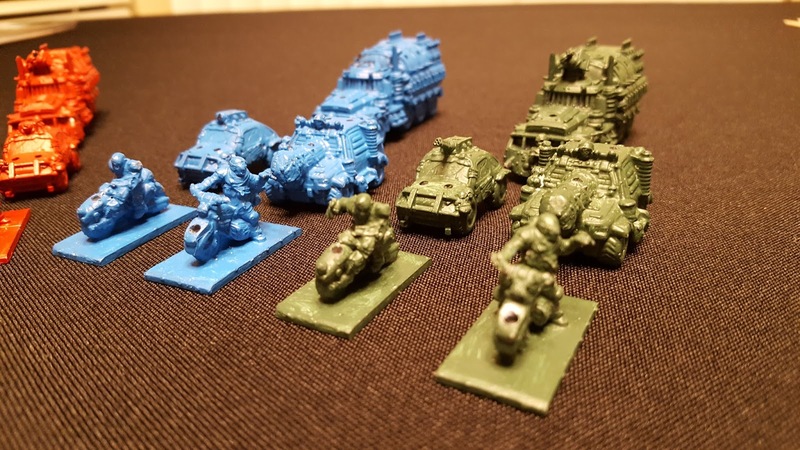 I was hoping for some variety in the vehicles (which I see they have created in the Kickstarter campaign) and some new ways to create more mayhem (hopefully this will come through expansions)!!! Wreck and Ruin is fast, furious, and fun. 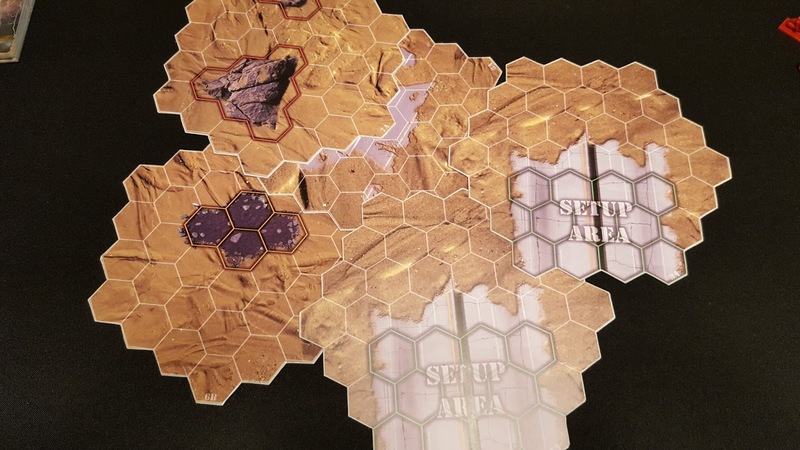 A skirmish game that takes you beyond Thunderdome! The miniatures are going to draw you in and the game play is going to keep you coming back for more. 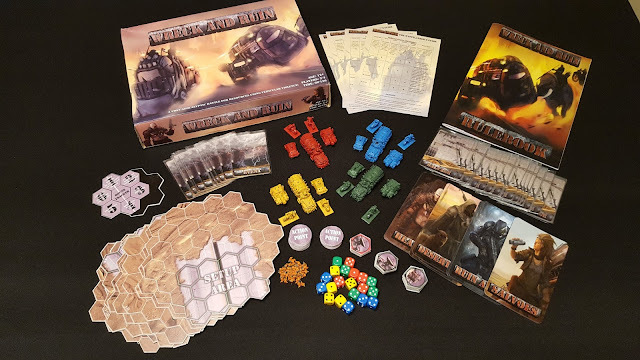 Players who like Heroscape, Memoir 44, and Incantris mixed with a great post apocalyptic theme will love Wreck and Ruin. Wreck and Ruin is on KICKSTARTER between now and November 2, 2017. Enter to win a copy on EverythingBoardGames.com between now and October 18, 2017.